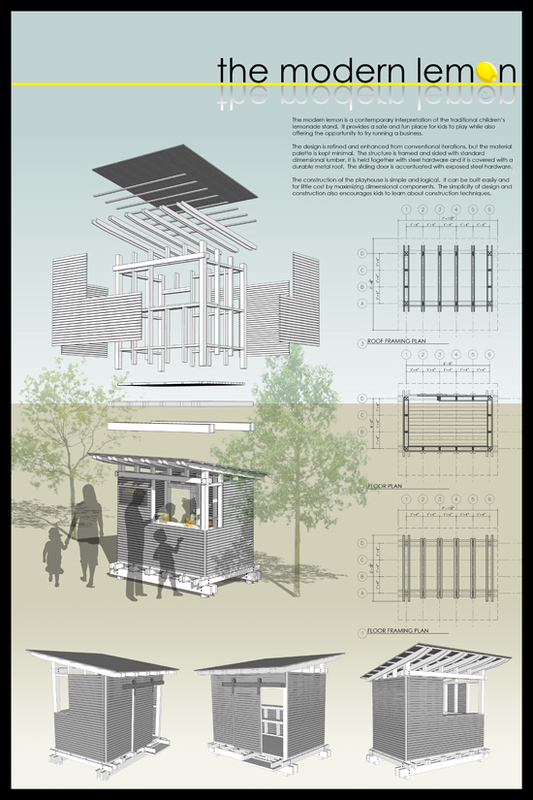 Today is the deadline for the Life of an Architect Playhouse Design Competition. Life of an Architect is an Architecture blog written by Dallas based Architect, Bob Borson. The competition was created to benefit Dallas CASA (Court Appointed Special Advocates). CASA is a nonprofit organization of community volunteers trained and supervised to serve as voices in court for abused and neglected children. The competition intent is simply this: Design a playhouse, raise some money and help children in need. Two Playhouse designs will be chosen and then built. They will be displayed in NorthPark Center in Dallas, Texas for two weeks in August 2012 along with approximately 18 other playhouses. Visitors can buy raffle tickets to win one of the playhouses. All proceeds from Parade of Playhouses help Dallas CASA recruit, train and supervise volunteers who advocate for abused and neglected children in the protective care of the courts. This competition was perfect to create something small and personal. It provided a great opportunity to flex my design muscles at a very digestible scale. Hopefully the judges will find it worthy. My design is called The Modern Lemon. Enjoy!